“You must be mistaken, they can’t be doing that,” the Vatnajökull National Park ranger said to Carl. 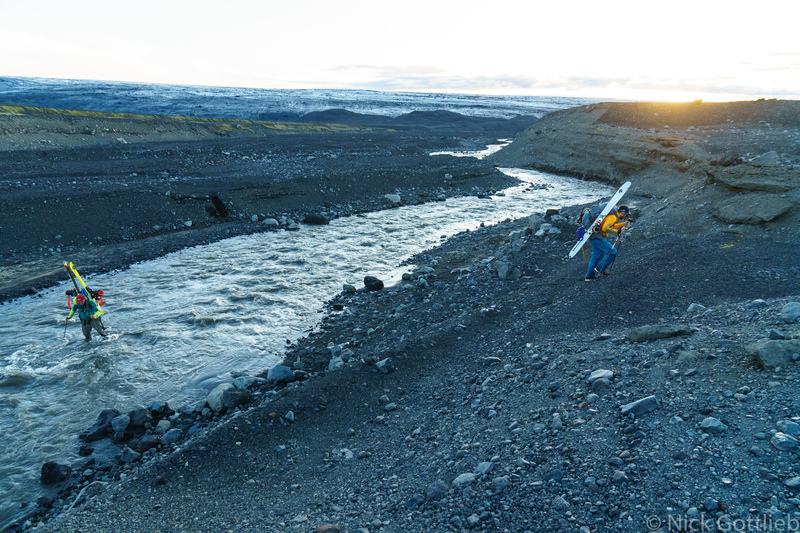 Carl had just arrived at the Sigurðarskáli mountain hut on the north end of the park with our packrafts and was waiting for us to finish our five day crossing of Europe’s largest ice mass, the Vatnajökull glacier in Iceland. He’d tried to explain our trip to the park ranger and the hut caretaker, but they were fairly certain nobody would attempt something like that, and that even if you were going to, you wouldn’t do it in July. Fortunately, we hadn’t spoken to these guys before planning the trip, and so at about the same time Carl was having this conversation, we were attempting to navigate a far-more-dangerous-than-expected crevasse filled ski descent complete with hot water bubbling up and running down the surface of the glacier. The beautiful basalt river canyon at Hljóðaklettar, shot on my 2017 trip. Before I knew it, I’d drawn a trip plan on Google earth and sent a few emails to see who I could rope into what I knew would be a sufferfest of epic proportions. Somewhere along the way, I found out Luc Mehl had done nearly the identical trip a few years earlier and I reached out to him for advice and beta; the main takeaway was that he wasn’t sure why anyone would want to repeat the trip. Right. Fast forward to 2018, I’ve hoodwinked two suckers into joining me on this mission, Wally Macfarlane and Paul Yelda. We get to Iceland and the first thing we see in the airport is a weather warning for Jökulsárlón, our starting point — gale force 80mph winds and heavy rainfall. No need to worry, we budgeted a couple extra days, the weather will undoubtedly improve if we push back our start a day. 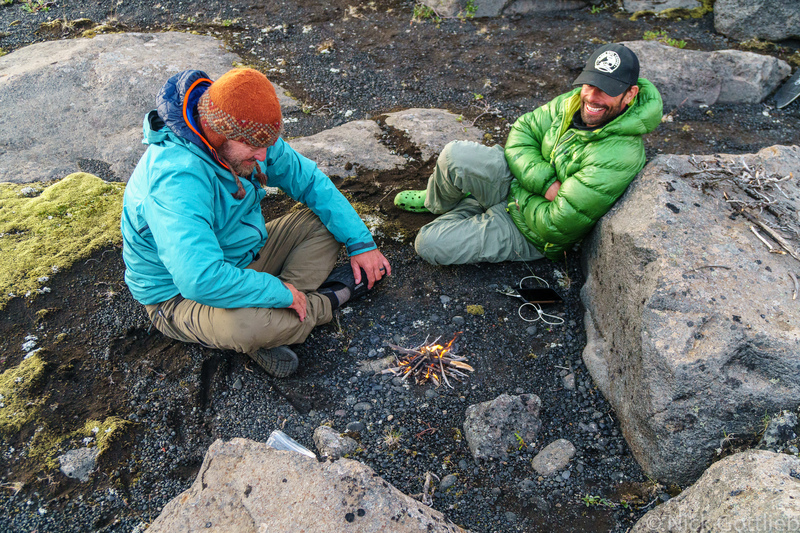 We head to a hot spring a few hours from Reykjavik and explode our gear to prep for the trip. Skis, packrafts, and glacier gear spread all over the parking lot, we get a lot of questions ranging from, “Where are you going to ski?” — never mind the fact that we could see snow covered slopes and glaciers from the parking lot — to “Did you hear about the British group that tried that trip?” No…”Google it.” I did Google it. Apparently multiple British groups have been rescued off the icecap while attempting crossings. I’m not sure which one in particular this guy was referring to. Not to worry. I may have a British passport, but I’ll be sure to tell SAR I’m American. 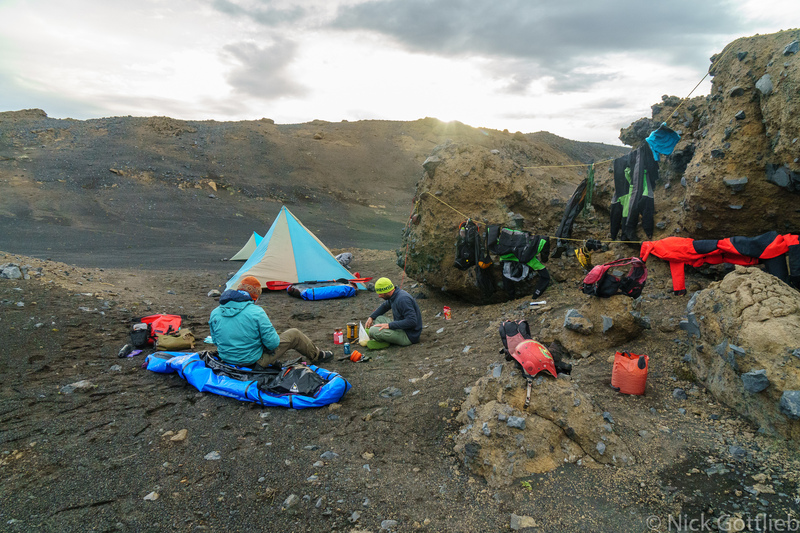 The next day, we head to Jökulsárlón, get our gear together, and set up camp for the night. Gale force winds still in effect, complete with heavy rain, we begin to wonder whether the 20-year old Megamid tent is really going to cut it for a five-ish day glacier crossing with high winds and heavy rain. Spoiler alert — no, but not much we can do about it at this point. We wake up and leave the car behind, keys stashed and a note on the dashboard that reads, “Car will be picked up by July 30th. DO NOT CALL SAR.” As you can tell, we really have the logistics dialed in on this trip. Groveling in the gravel. You’re going the wrong way Paul! Things get off to an inauspicious start — some “fun” gravel ice maze hiking (with loaded packs and skis on our backs) leads to a glacial-outflow stream crossing that was a hell of a lot deeper than when I’d seen it the previous year. Naively wanting to keep our shoes dry, we all cross barefoot and discover that the riverbed was made of ice. Wally breaks a pole. A day and a half of jumping over crevasses in trail runners follows. If I did it again (I probably won’t), I’d bring microspikes. 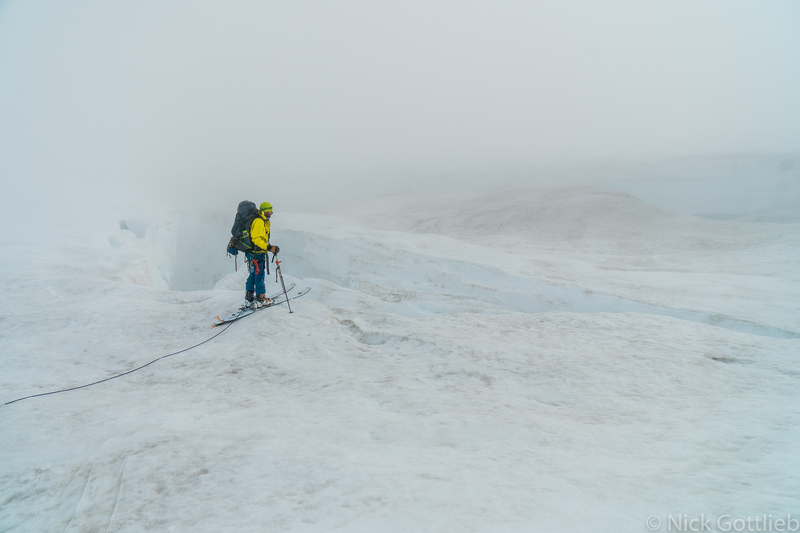 Day two brings low visibility, crossing the snowline, getting dead-ended by massive crevasses, and backtracking. We camp in a crevasse-free snowfield in the rain and wind, starting to get really worried about how wet our down sleeping bags are. Oh, also: Paul used his sleeping pad to protect his skis from his crampons when he packed for the trip. Yep. Paul brought microspikes. Be like Paul. Day three starts roped up on skis — a big improvement from cramponning around — but we are surrounded by slots and have barely made any progress since hitting snow. We cross a few tenuous snow bridges and find ourselves on the edge of a rather deep chasm with no route forward. Paul — he’s a firefighter — says, “I have a plan, but I don’t think you’re going to like it. 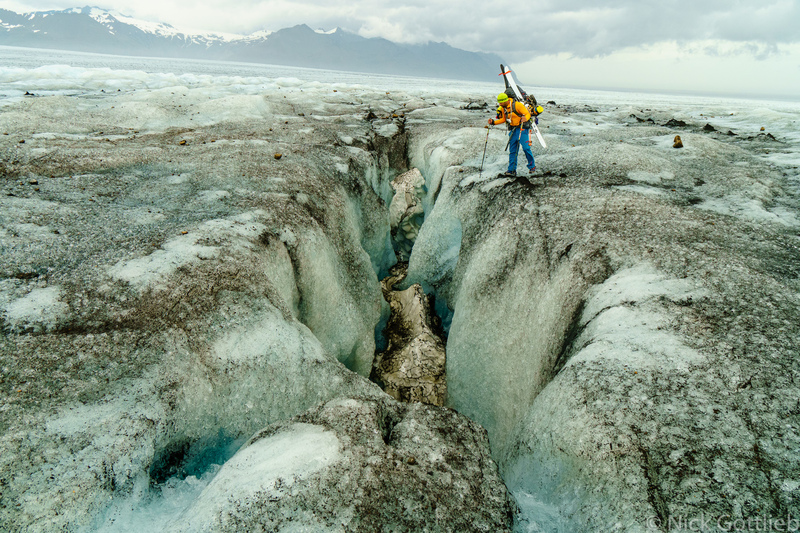 It starts with us rappelling down into the crevasse…” I propose an alternate plan — backtrack and hope for the best — and thankfully, as we work our way back the way we’d come, the fog lifts and the sun elucidates a path through the crevasses up onto the icecap. Or at least, it shows us a route that’s a hell of a lot less terrifying than the one we had been on, and we pick our way around and over another hour of crevasses before topping out on consistent snow in the sun. Things are looking up. Paul’s a fireman. Firemen always have a plan. We skin till 11pm that night and cap the day off with a nice skins-off descent to camp, nothing but snow visible in any direction. It was a cold night and the couple hours of sun hadn’t done much for our sleeping bags, but at least it wasn’t raining anymore. 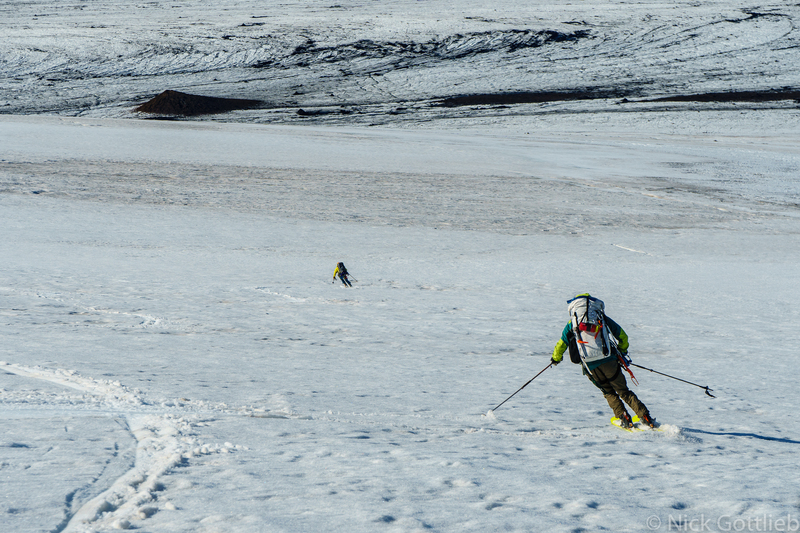 Day four is as eventful as 12 hours of flat skinning on a glacier can be. My boot breaks, my toe piece starts wobbling, and I eat a lot of snacks. 10:45 PM. Wally thinks it’s bedtime, but Paul and I are too far ahead for him to tell us that. Day five — now we’re back where we started. Carl, warm and dry at the hut laughing with the caretaker and park ranger, drinking beer. Us, standing atop a crevasse-ridden slope, our ski tracks crossing a black runnel of hot water flowing down the glacier behind us. Hut in sight, but miles of ice, moraine, and river crossings still between us and beer. I have cell service and call ahead to say we’ll be down in no time. Nine hours of skiing, hiking, wading, and scrambling later — all under the watchful eye of an actively smoking volcano — I’d jumped over countless crevasses, crossed two rivers, climbed in and out of a slot canyon, broken a few buckles on my pack, and fallen more times than I care to remember and arrived at the dirt road from the hut to the edge of the glacier. Carl picked us up on the road and drove us the mile back to the hut where dinner, beer, and some extremely skeptical Icelanders were waiting. Obligatory skiing shot. This was a ski trip after all, right? The next morning, the hut caretaker told me, “You know you kind of did this pretty late in the season.” Oh yeah? “Well, the season is usually February.” It was August 3rd. The final obstacle before the hut! 10PM. We exchanged our skis for packrafts and whitewater gear, restocked with some food we’d left in the car, and after a lazy morning, launched on the Jökulsá á Fjöllum ready for five days of relaxing river life, happy to be anywhere that wasn’t frozen. 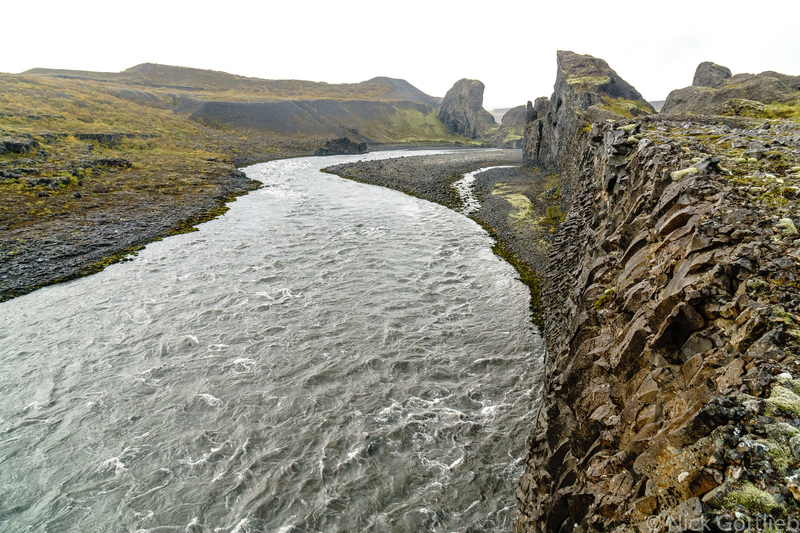 The river was high volume right from the start, but braided out in a maze of newly formed basalt channels. 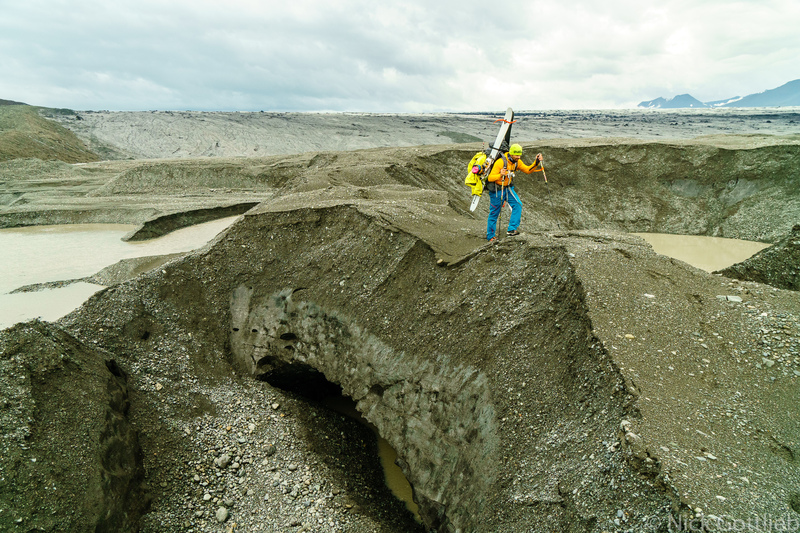 According to Luc Mehl’s trip report, it was fully blocked in this section by a still-smoking lava flow when he paddled it — his group actually had to get out and portage to another channel. The lava flows were obvious (and mind-blowing), but we were able to float on through and day one was mostly spent meandering through basalt and gravel braids with one fun class IV rapid. Honestly could not wait to put miles between us and that stupid chunk of ice. It took a few days before we lost sight of it unfortunately. Have I mentioned I’d never been in a packraft before? I’m very impressed by these things. They are amazingly capable whitewater boats, but every time you do something that would be totally mundane and normal in a kayak — paddle into an eddy, front-surf a wave, boof — it’s like someone told a hilarious joke. 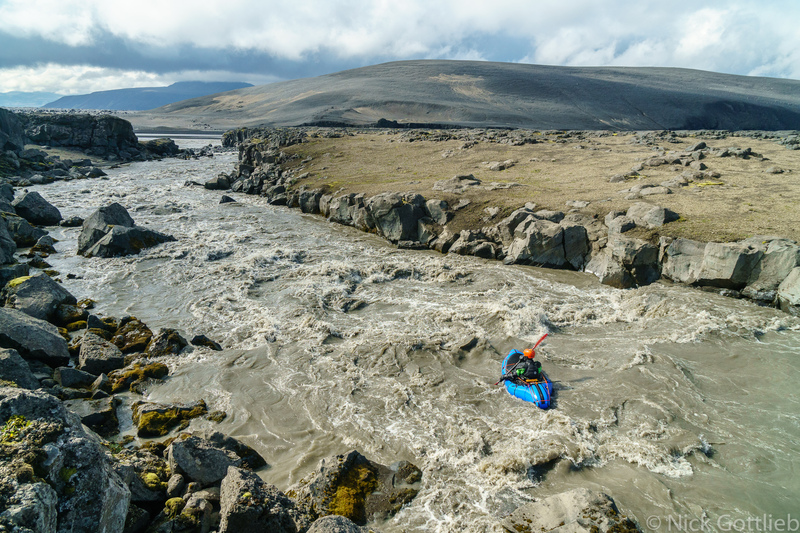 I laughed out loud more paddling the Alpackalypse on this cold, foreboding river in Iceland than I have laughed in my nearly two-decade kayak career. It’s like someone transformed your kayak into a giant rubber ducky bath toy, except magically retained all the whitewater performance. There’s a reason people talk longingly about river trips. Our first night on the river was refreshing. Beer, good food, a beautiful camp. It wasn’t even raining. We were glad to be settling into the routine of River Life, a much more pleasant routine than that of Mountaineering Life. 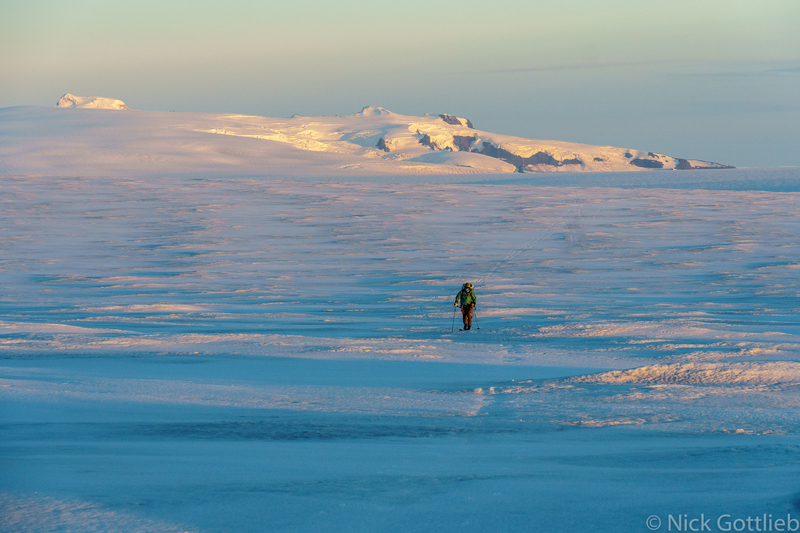 Someone nostalgically suggest our route across the icecap was a “one-and-done” — not sure if the intention was to say that because of climate change and receding glaciers or because it was so awful. Most likely a bit of both. We were a bit desperate. We didn’t really know what to expect from the river. 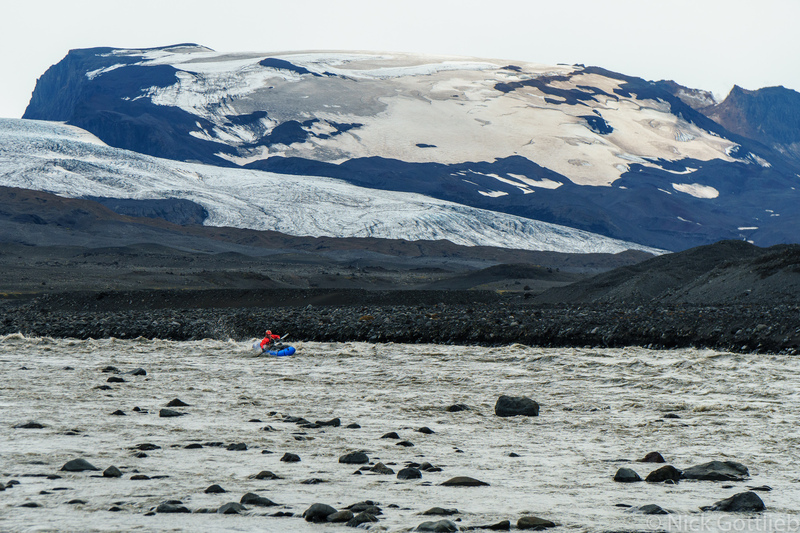 I’d focused most of my planning on the glacier and the gear exchange logistics, thinking, “We’re all kayakers, the river goes downstream, we’ll work it out.” As such, when we rounded a corner into a stunning basalt canyon on day two, it was a pleasant surprise. The river continued to surprise us with only a few shallow braided sections and lots of whitewater ranging from class II-IV with a few bigger rapids and incredibly unique canyons and scenery sprinkled throughout. One of many enjoyable rapids. The one thing we did know about the river was that after crossing under the Highway 1 bridge, we would encounter “Europe’s most powerful waterfall,” Dettifoss. I’m not exactly sure what metric they use to come up with that designation, but Dettifoss is a high volume ~150 foot waterfall, preceded by Selfoss, a 30 footer, and followed by Hafragilsfoss, about 100 feet. I’d seen these three in 2017 on my sight-seeing trip and the canyon below was part of what piqued my interest — think Grand Canyon-scale with basalt walls, springs cascading in on both sides, and a couple massive waterfalls. We knew we’d be walking this sequence, but weren’t sure about the canyon below Hafragilsfoss. 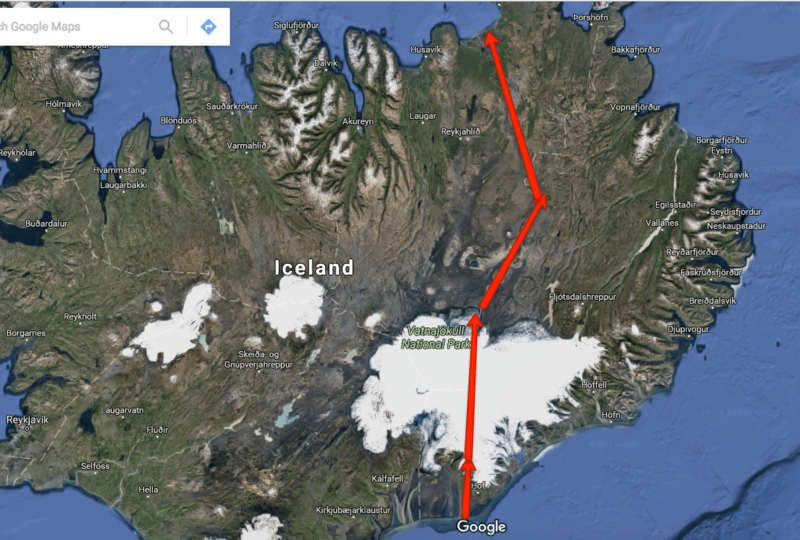 Google maps showed another waterfall, Réttarfoss, and it was hard to get an idea of what it looked like on the internet — surprisingly few photos around — so we were nervous about committing to the canyon and ended up portaging all the way through to Réttarfoss. 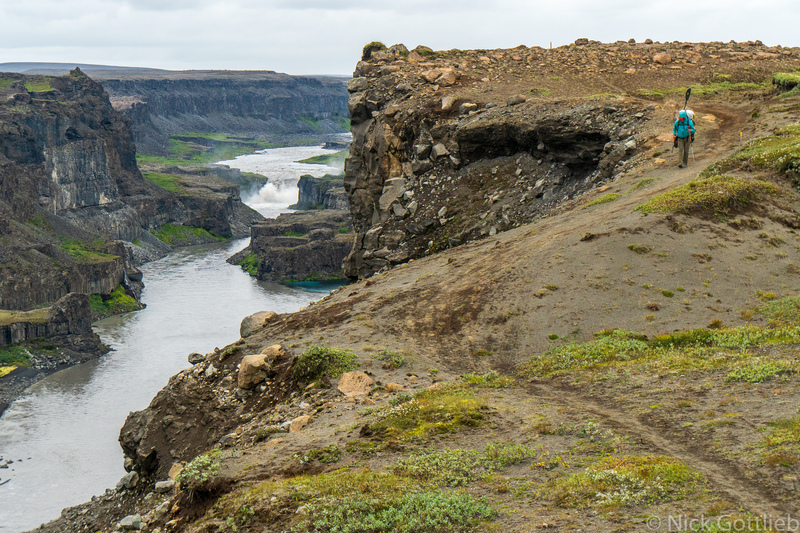 Sidenote, if you go to Iceland — hike that portage trail! Beautiful, not crowded, and a great way to see more of the river than the paved zoo at Dettifoss. 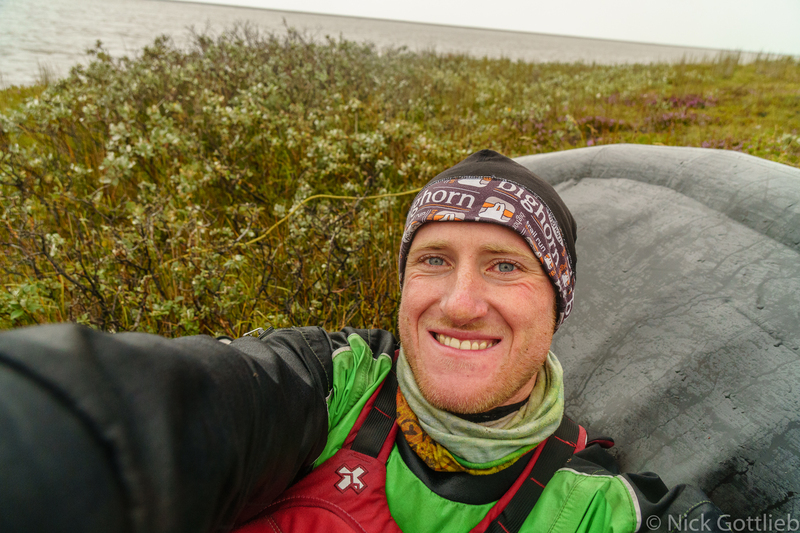 Wally did the whole 10km portage in flip flops because of horrible blisters on his heels from the icecap. Unfortunately, our weather window deteriorated towards the end of our portage and while our camp was stunningly beautiful — waterfall and canyon upstream, tributaries cascading off the walls, big class IV rapid below — we were too cold and tired to hike around and enjoy it. It rained hard and didn’t stop, so the next morning, we packed and headed downstream, knowing that the biggest whitewater was yet to come, but not knowing how big it would be. The next 7km were amazing — continuous big water class IV whitewater surrounded by the most unique basalt formations I’ve ever seen (google “Hljóðaklettar”). I was definitely nervous about the packrafts here — it was continuous enough (and cold enough) that a swim would’ve been really problematic, but the boats shined and we all made it through. Although Wally looked like he’d seen God. We waved at the confused tourists at Hljóðaklettar as we floated past. The whitewater relented and the canyon walls fell further and further away. After the canyon, the river crosses under another road and braids out into multiple channels that reach the ocean in surprisingly distant locations. Luc had warned me about this section. His exact words were, “just mentioning it so that you are mentally prepared for a tough finish. Or maybe you will have sunshine and babes in bikinis cheering you on.” We did not have sunshine, nor were there babes in bikinis. I have never paddled a ten miles as hard as those before. We passed the highway bridge before noon and I casually remarked that we would be early for our five o’clock meet-up time with Carl. Paul is the only one who actually made it to the ocean. I got to the calm water inside the seawall and the water tasted salty so I called it good. Wally got out earlier because he saw Carl on the road. Paul paddled out into the surf never to be seen again. I changed out of my drysuit in an unlocked utility shack. The takeout selfie: cold, hungry, and wondering where Paul, Wally, and Carl were. We went to Akureyri to decompress afterwards and spent a few hours at the community pool there. I highly recommend it. They have two enclosed waterslides. One of them has a surprise in it. You’ll have to go see for yourself. Thanks for reading. There’s also an un-edited collection of photos from this trip on my photo website: https://www.nickgottlieb.photography/Special-Collections/n-ZMC2Rt/Iceland-for-Paul-and-Wally/. Dude, that is epic. Great stuff. Thanks! it was definitely…something! hahah, no, it was awesome, just a bit gnarlier than I originally expected. Great story and images. With this virtual experience, I for sure will never have to try crossing that damn ice cap. Amazing adventure and fabulous documentation (story and photos)! I respect the ability to endure and appreciate “suffer-fests” and this adventure appeared to be right up there with some of your tops. Way to go and pull it off! That’s an awesome and hilarious story! Thanks for sharing.